Many of you will know that single malt whisky comes 100% from malted barley. But there are other grains that can be used in whisky production, such as wheat, maize or rye – though they wouldn’t make the grade for being single malt whisky. As single malt whisky is barley-based whisky that comes from one single distillery, single grain whisky would be non-barley based whisky stocks from one distillery – and blends, from more than one distillery. Still with me? I’m glad someone is. Now, grain whisky on its own can be amazing, but grain whisky quite often ends up in mass-market whisky blends such Famous Grouse or Bells. In fact, one of my favourite whiskies is a single grain whisky. We’re also starting to see more and more single grain on the market these days, perhaps as consumers look for something a little different. So that brings my search for more of this type of whisky to Compass Box Hedonism. Compass Box are ‘artisan‘ Scotch whisky makers, buying stock from distilleries and turning them into fine things indeed. Hedonism is made up of between 8 to 15 casks of grain whisky, from a range of distilleries, and most of which has been aged in first-fill (first time it’s been filled with whisky) American oak casks. Colour: very pale, lemon chiffon, straw, gooey brie. On the nose: that unmistakable metallic zing of grain whisky. Citrus notes. Waft of Manchego cheese. Brandy. Tropical fruit. Oak. In the mouth: god I love grain whisky. A dollop of creamy syrup on the tongue: not too heavy, just a medium weight. Wonderful warming feel, without being overly peppery. Strong oak influence there. The finish is wonderfully cherry sweet and creamy. Pure silk. Grain whisky, single or blended, really is something quite different, so I recommend giving it a shot. As far as grain whisky goes – this is utterly lovely. 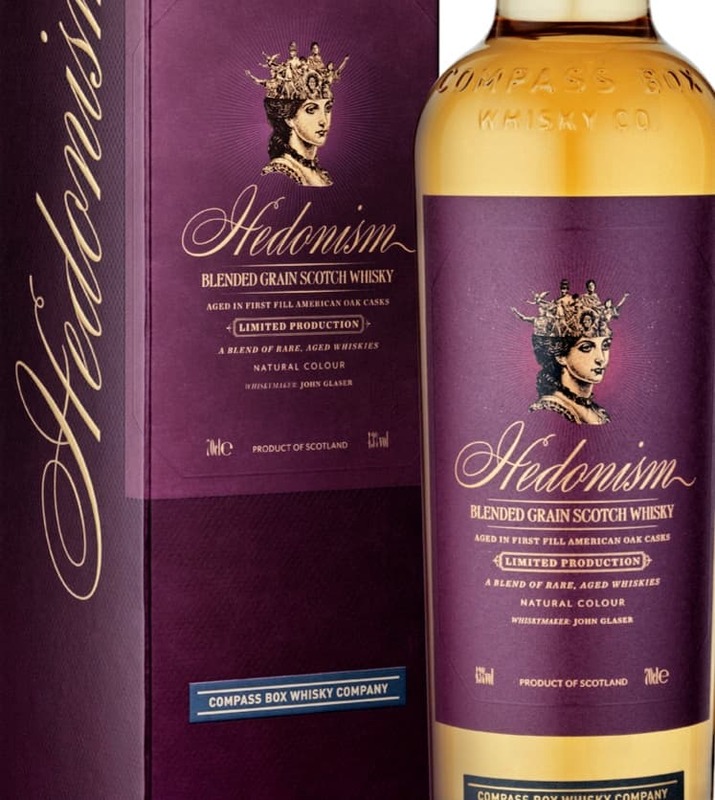 Bottled at 43% ABV, a bottle of Compass Box Hedonism of this will set you back around £50-70, depending on the store. Well it was linked to your recent post so I thought I’d say hello. I like this and I like the Nikka but I can’t drink much of it in one go. It’s like drinking several drams of bourbon-times 2. It’s a kind of classic since your original review but it’s a tough prospect drinking a few drams in one go. An after dinner whisky.